"It’s versatile and easy to maneuver for operators of all skill levels, allowing you to increase productivity and lower labor costs for turf treatment jobs." Ness Turf Equipment, the premier distributor of ag and turf solutions in Hawaii and the Pacific Region, expands their product line with the new Exmark Stand-On Spreader Sprayer. With advanced new technology, it’s unmatched in versatility, stability, and control. 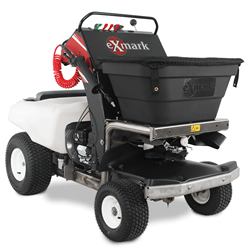 The Exmark Stand-On Spreader Sprayer is an industry-leading turf management vehicle. It features a stainless steel frame with a powerful hydrostatic Subaru EX27 engine. The Tuff Torq drive system reaches a ground speed of 5.5 mph forward and 4.0 mph in reverse. The innovative model is also full of new benefits and features. Advanced lean-to-steer controls allow operators to direct vehicle motion with one hand. The agitation system includes two induction nozzles inside a 20-gallon tank that mix chemicals and keep them in suspension for a more consistent spray. Operator improvements include an intuitive control panel and isolation mounts on the rider platform. Contact Leonard Smith at 808.486.8301 or lsmith(at)nessturf(dot)com for more information on the Exmark Stand-On Spreader Sprayer.